Essential oils are in high demand and it seems like there is a new company sprouting up almost weekly that offers "The BEST" essential oils that money can buy. Recently, there has been a debacle going on in the aromatherapy industry involving adulterated essential oils. Adulterated Blue Tansy essential oil is what got the ball rolling. An aromatherapist noticed that her bottle of Blue Tansy did not smell like it should and it prompted her to have it tested to find out exactly what was in her bottle. Come to find it, it was not pure Blue Tansy oil. In the following weeks, many other aromatherapist sent in samples of various oils to have them tested too. It was shocking to see the GC/MS test results indicating that several essential oils were either synthetic or adulterated. 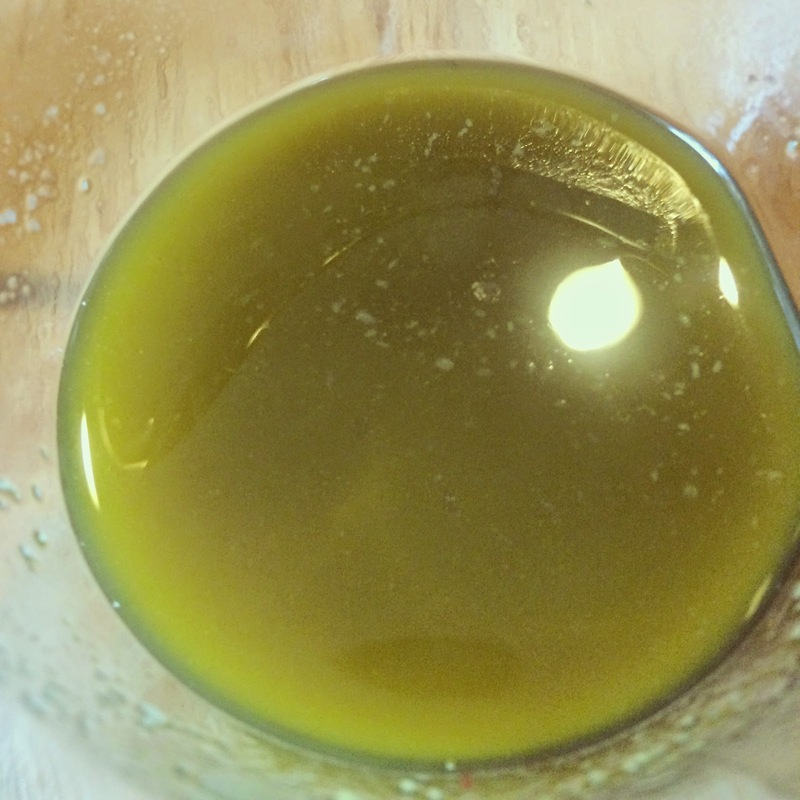 It is essential to buy high quality oils; cheap oils or “bargains” are almost always of poor quality. 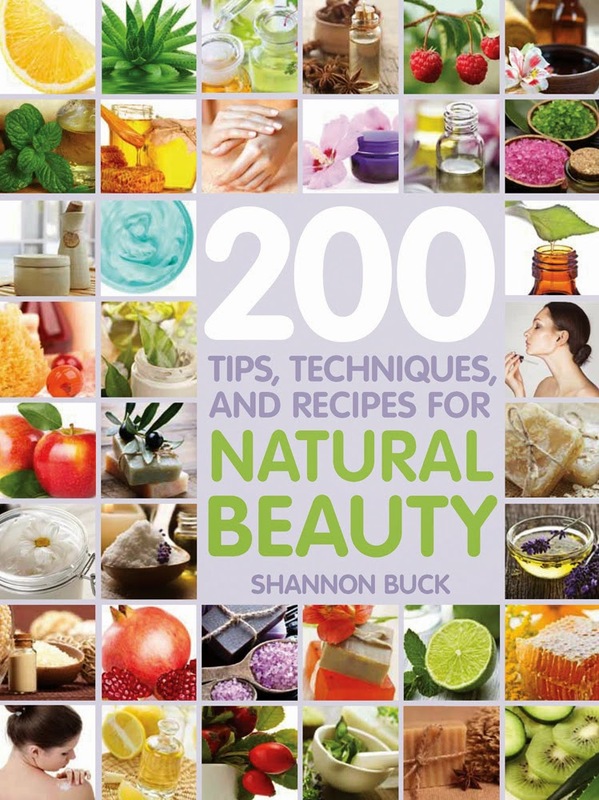 In order for essential oils to have a therapeutic effect they must be pure plant extracts. 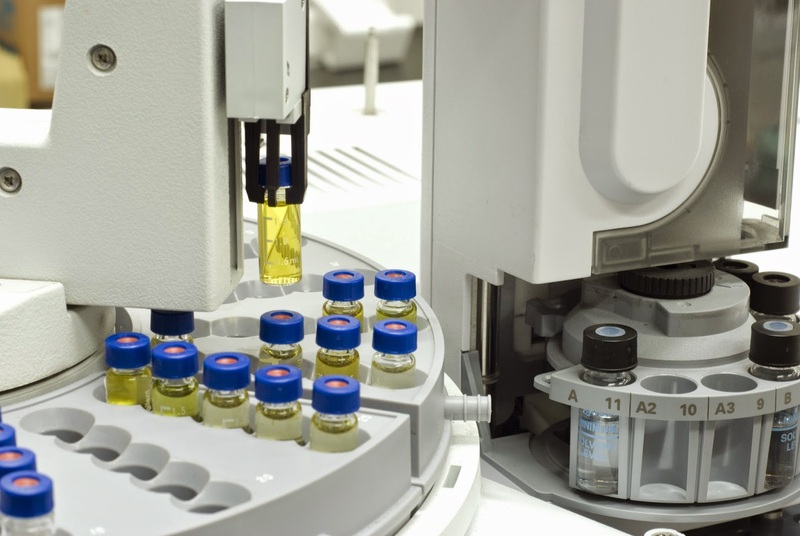 The best way to assure purity and quality of each batch of oil is by knowing your source and testing the oil with Gas Chromatography/ Mass Spectrometry (GC/MS). Gas Chromatography (GC) is a method of separating the volatile compounds in essential oils into individual components. The result is a linear graph that charts these components. Mass Spectrometry (MS) identifies each of these components and their percentages. This process is used to identify any adulteration of the essential oil tested. Adulterated oils or perfume oils will not offer therapeutic effects and may in fact cause allergies, headaches and chemical sensitivities. The precise breakdown of the chemical components in individual oils provided by GC/MS reports is important as the therapeutic benefits and safety issues of essential oils are, in large part, determined by their chemical makeup. Testing every batch of oil with GC/MS technology assures purity and gives us the exact chemistry of each oil. This process is vital for medicinal blending and for quality assurance. You should purchase oils from companies that can provide you with honest GC/MS reports for every oil they sell and they should be batch specific for that particular bottle of oil. The old saying "You get what you pay for..." is true for essential oils. If the price is too good to be true, it probably is!! 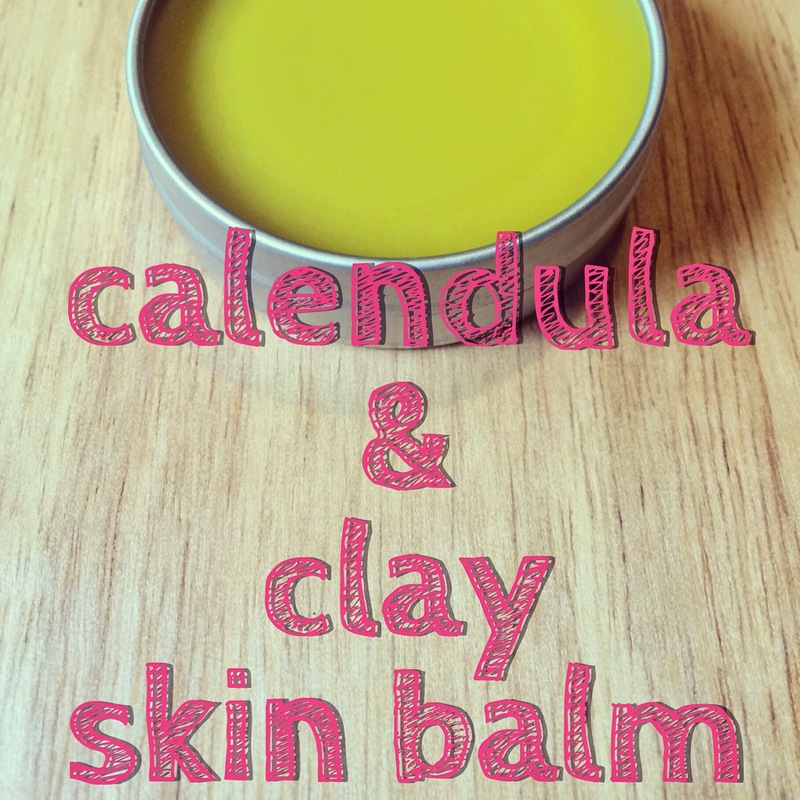 I recently spotted a particular brand of hand salve that contained bentonite clay as one of the main ingredients. This particular clay-based balm was touted as having advanced healing properties from the addition of the clay. The clay also negates the normal greasy and slippery feel that most salves and balms tend to impart to the skin. I set out to make my own version and it turned out wonderful!! This product is made from nourishing ingredients such as handcrafted calendula infused olive oil, beeswax, clay, helichrysum essential oil, myrrh essential oil and frankincense essential oil. A little goes a long way!!! 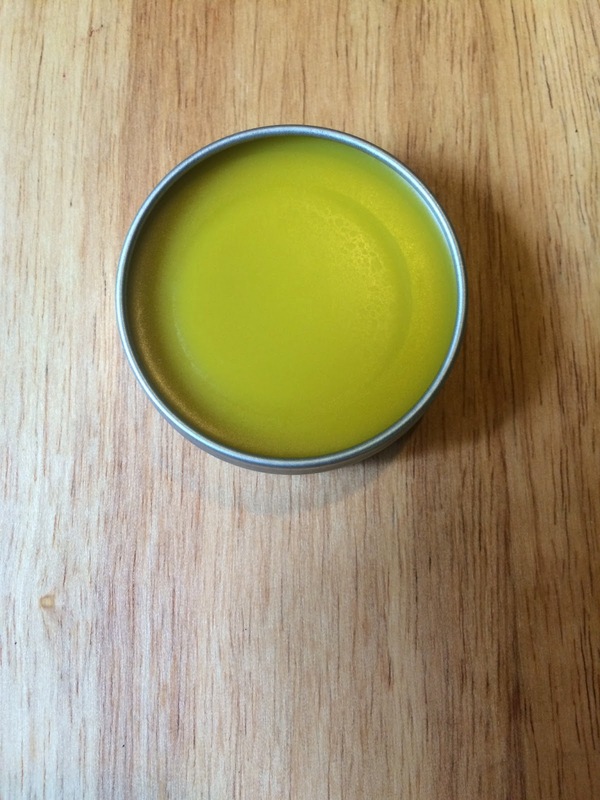 This particular skin balm is perfect for over worked hands, parched skin on all areas of the body and can be applied to patches of eczema to help soothe and protect those irritated areas. 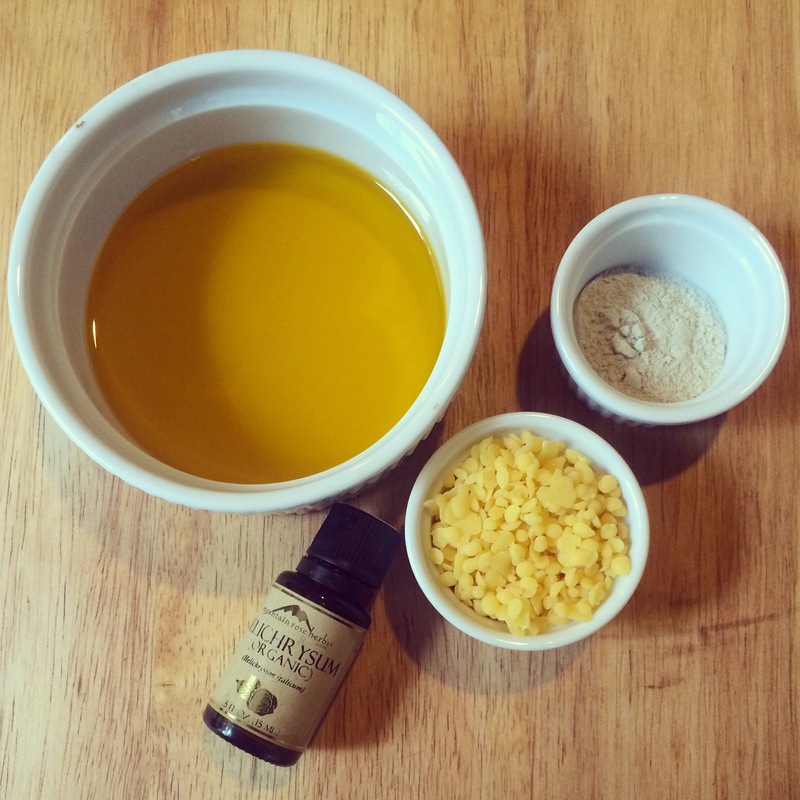 You will need to make some homemade calendula infused carrier oil (I chose olive oil). You will need six tablespoons. Click here for a tutorial on how to make it. 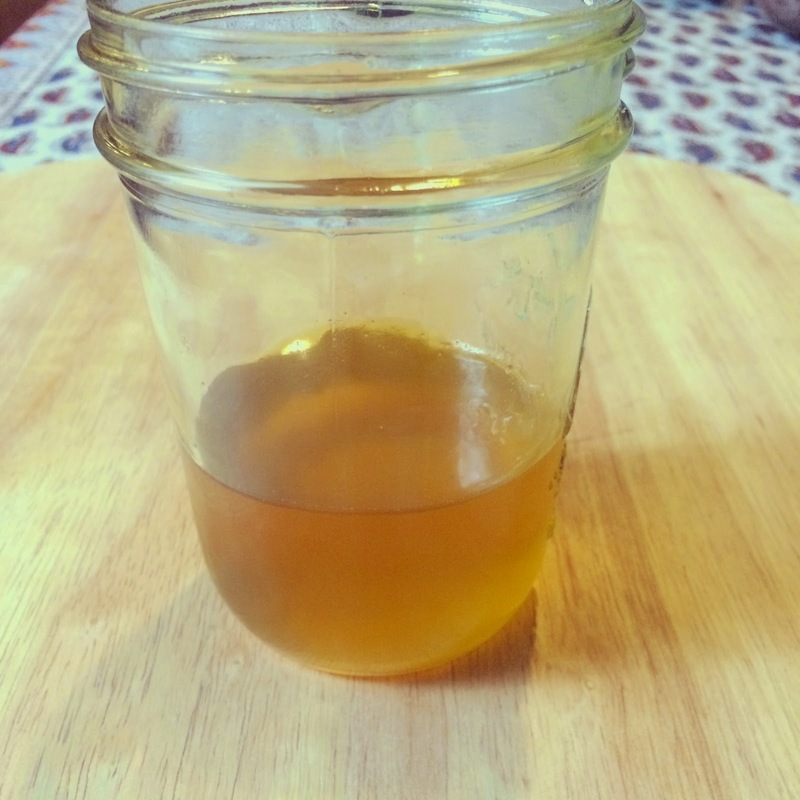 Calendula infused oil is such a wonderful ingredient to have on hand! According to Mountain Rose Herbs, "Not only one of the most effective topical oils, it also makes an excellent base for salves, facial creams and many other natural cosmetics. Gentle, cooling, and soothing. Calendula oil is the most successful oil for assisting us with dry and damaged skin, irritations, and other skin ailments. Makes a wonderful baby’s oil and is exceptional for those with sensitive skin." 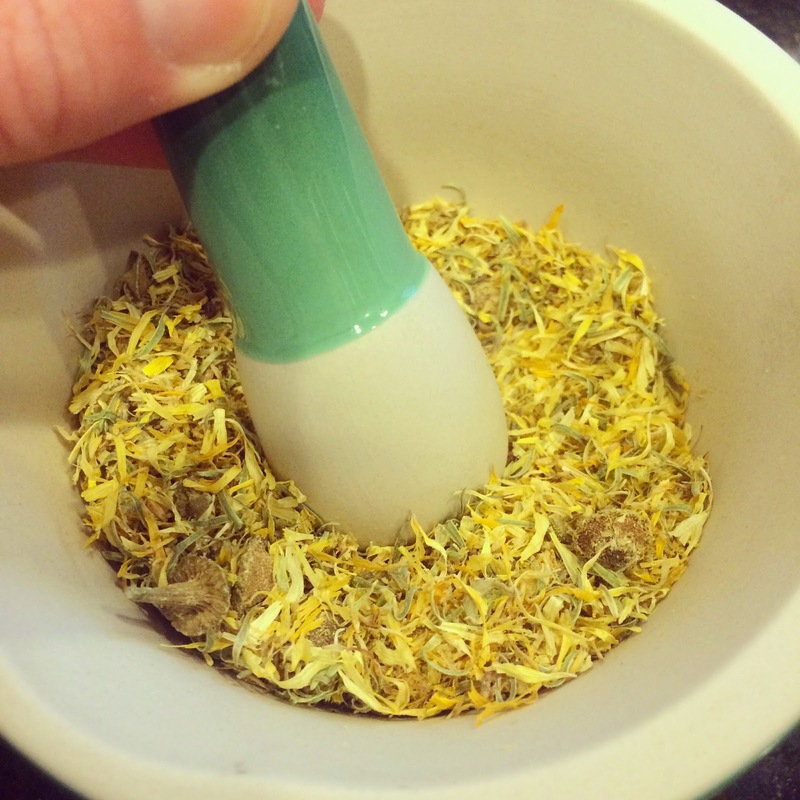 If you don't have time to make it yourself, you can purchase it from Mountain Rose Herbs. Click HERE. 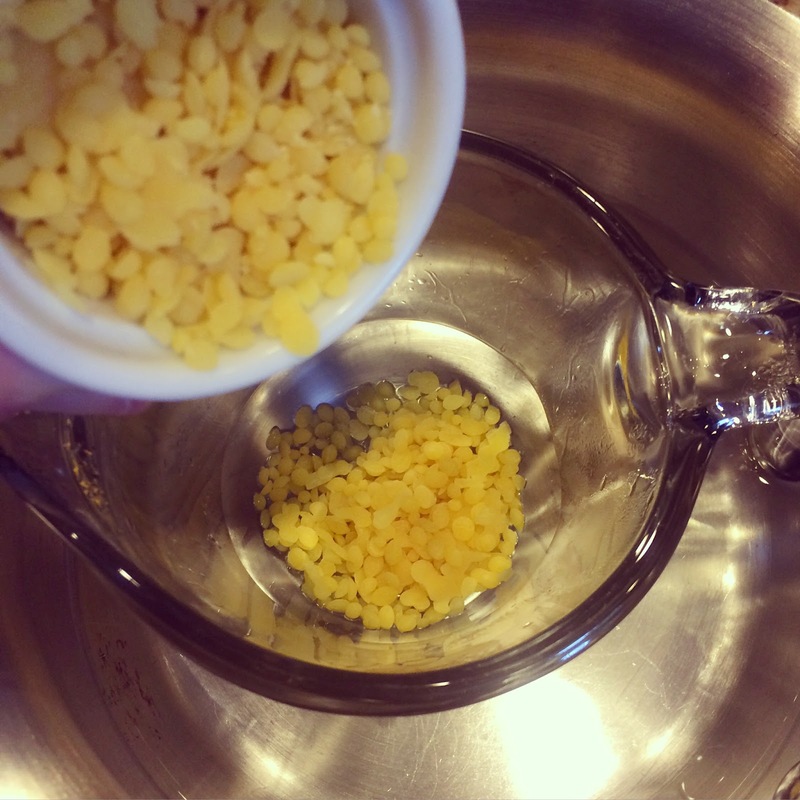 Start out by melting your beeswax in a small glass measuring cup placed in a few inches of simmering water. Once the beeswax is melted, add in the calendula oil and the clay. The mixture will need to be remelted which takes just a few minutes while constantly stirring. Remove from heat. The clay will give it an opaque appearance. Pour into metal or glass tins to harden. 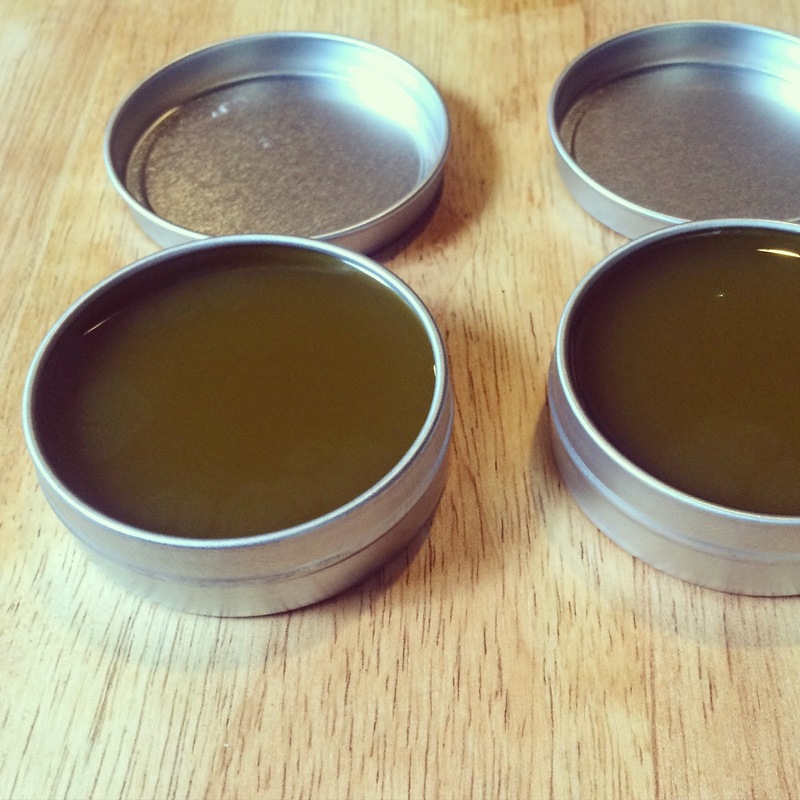 The balm's appearance will look dark until it has completely cooled down. I like to place it in sturdy metal tins. Once it has cooled, place a cute label on the container. Perfect for gift giving!! Has a 6 months shelf life when kept away from heat and moisture. I got most of the ingredients from Mountain Rose Herbs. Visit them here. Most folks get that "down-in-the-dumps" kind of feeling every now and again. I know I tend to feel sad and tuckered out during the short days of Winter and then I quickly snap out of it once Spring arrives and I wake up to the harmonious sound of chirping birds. During Winter, I often diffuse essential oils that are known to balance the mood and lift the spirit. 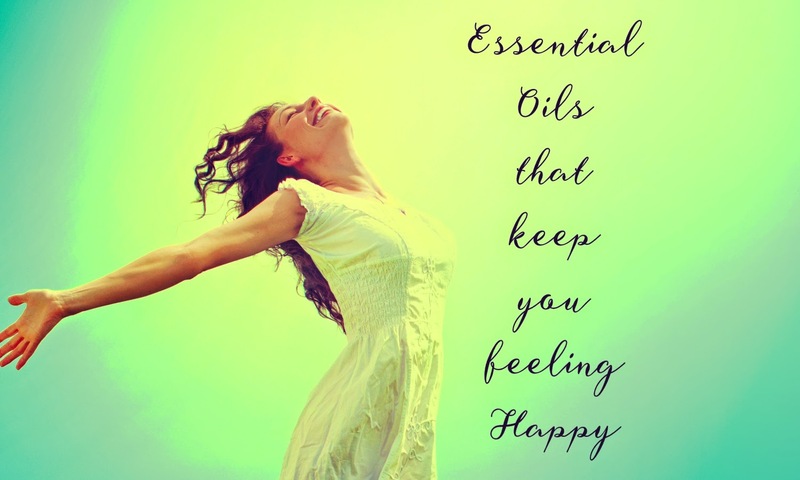 Check out these mood balancing and uplifting essential oils! You can purchase these from Mountain Rose Herbs! Lavender (Lavandula angustifolia): This sweet, floral and herbaceous oil is steam distilled from the flower tops of the lavender plant. It is a middle note with anxiety reducing properties as well is a wonderful oil to use when you need to decompress and unwind. May help relax you when you can't fall asleep on your own. I like to use it in a massage blend and also via diffuser. Currently, Mountain Rose Herbs is offering a 1/2 ounce bottle for only $10.25 and theirs is Certified Organic! Visit Mountain Rose Herbs HERE!!! Tangerine (Citrus reticulata): This fresh, sweet and orange-like essential oil is cold pressed from the fruit peel of the tangerine fruit. It is a juicy top note that may help calm the nervous system when diffused into the air. It may cause skin irritation if not highly diluted when applying it topically. It has similar properties as Mandarin Orange but smells a bit different. Currently, Mountain Rose Herbs is offering a 1/2 ounce bottle for only $2.75. Visit Mountain Rose Herbs HERE. Sweet Marjoram (Origanum majorana): This bright and sweet essential oil is steam distilled from the flowering plant. It is a middle note that is considered a comforting aroma that may ease depression and calm your nerves. It blends well with cedar wood, cypress, peppermint, orange, and bergamot. I like to make a blend and diffuse it in my bedroom to help me unwind before I sleep. It is also awesome added into a massage cream. Currently, Mountain Rose Herbs offers a 1/2 ounce Certified Organic bottle for only $13.75. Check out Mountain Rose Herbs HERE. Peppermint (Mentha piperita): This fresh, minty and herbaceous essential oil is steam distilled from the flowering plant. It is a top note that helps to elevate your mood from super sad to happy-in-a-hurry! When blended with Rosemary essential oil, it makes a lovely diffuser blend. It needs to be avoided in epilepsy and while pregnant. A little goes a long way and is a skin irritant which makes it best used via diffuser. I use it for those pesky PMS symptoms that pester me periodically. Currently, Mountain Rose Herbs offers a 1/2 ounce bottle of Certified Organic & Fair Trade Certified Peppermint Essential Oil for just $7.50. Visit Mountain Rose Herbs HERE. Spruce (Tsuga canadensis): This sweet-fruity and very pleasant smelling essential oils is steam distilled from the needles of the tree. It is good to use this particular oil when you are under a prolonged amount of stress and need help to balance and adapt to it. It has a very comforting aroma and is good in massage blends as well as diffuser blends. It blends very well with galbanum, lavender, cedar wood and rosemary. Mountain Rose Herbs offers a 1/2 ounce bottle for only $9.50. Visit Mountain Rose Herbs HERE. Bulgarian Rose (Rosa damascena): This sweet-floral and rich essential oil is steam distilled from the flower petals. It is a deep middle note that is very complex. It is super uplifting to the mind and spirit. It can help to comfort you during times of profound grief and shock. It may ease occasional anxiety and stress. It blends very well with sandalwood, ylang yang, vetiver, patchouli, ginger, bergamot and chamomile. I personally find it too expensive to diffuse into the air and would rather add it to a perfume or massage blend so I can keep it close to my body. It takes around 10,000 pounds of freshly picked rose petals to distill just a single pound of essential oil. It is one of the most expensive essential oils available. Luckily, Mountain Rose Herbs offers a small 1/8 ounce bottle for $179.50. It does not take very much to be effective. Ylang Ylang (Cananga odorata): This rich and sweetly floral essential oil is steam distilled from the flowers. It is a delicious base note and the largest producing countries are Comoro Islands and Madagascar. It is well known for its sedative properties and its ability to make you feel relaxed and euphoric. A single drop in a massage blend is effective. I like to make a blend of Sandalwood, Rose, Grapefruit and Ylang Ylang. It needs to be avoided when pregnant. Mountain Rose Herbs offers a 1/2 ounce bottle of Certified Organic essential oil fur just $14.25. Visit Mountain Rose Herbs HERE. Lemon Balm (Melissa) (Melissa officinalis): This light and fresh essential oil is steam distilled from the flowering plant. It is well known for it ability to calm when necessary and lift the spirits when called upon. It is good for sudden shock and prolonged grief. It is a middle note and blends well with all of the citrus oils, frankincense, lavender, neroli, and rose. It is one of the more expensive oils. It only takes a small amount and can be a skin irritant. Mountain Rose Herbs offers a 1/8 ounce bottle of Certified Organic Lemon Balm essential oil for $64.25. Visit Mountain Rose Herbs HERE. Bergamot (Citrus Bergamia): This fresh and spicy essential oil is cold pressed from the fruit peel. Make sure you buy Bergaptene-free to reduce the phytotoxicity of the oil. It is a citrus top note that blends well with vetiver, all citrus oils, geranium, lavender and nutmeg. It is super refreshing and is uplifting to the mind and spirit. Great in diffuser blends! It is what gives Earl Grey tea its signature flavor. Mountain Rose Herbs offers a 1/2 ounce of Certified Organic essential oil for just $16.50. Visit Mountain Rose Herbs HERE. Neroli (Citrus aurantium): This sweet-floral essential oil is steam distilled from the flowers of the orange tree. It is a good choice when promoting a balanced mood due to depression and anxiety. It takes approximately 100 pounds of blossoms to produce a single pound of oil. Mountain Rose Herbs offers a Certified Organic 1/4 ounce bottle for $112.50. Visit Mountain Rose Herbs HERE. Geranium (Pelargonium graveolens): This sweet and floral oil is steam distilled from the flowers and leaves. It is a heavy middle note that is balancing and uplifting during times of stress and anxiety. It is a good choice when blending for symptoms of PMS. You want to avoid this oil during pregnancy. A little goes a long way and could irritate skin. Great in diffuser blends. Mountain Rose Herbs offers a 1/2 ounce bottle of Certified Organic oil for just $18.50. Visit Mountain Rose Herbs HERE. Jasmine Absolute (Jasminum grandiflorum): This deeply floral and rich absolute is solvent extracted with Ethyl alcohol from the flowers. It is a good choice for blends meant to be uplifting during stress and grief. Good for anxiety and when you are just too tuckered out to stay up and need an uplifting boost. It takes over 2,000 pounds of Jasmine flowers to produce a single pound of oil. Best used in blends that will be applied to the body versus diffused into the air. It is a middle note. Mountain Rose Herbs offers a 1/8 ounce bottle for just $68.75. Visit Mountain Rose Herbs HERE.